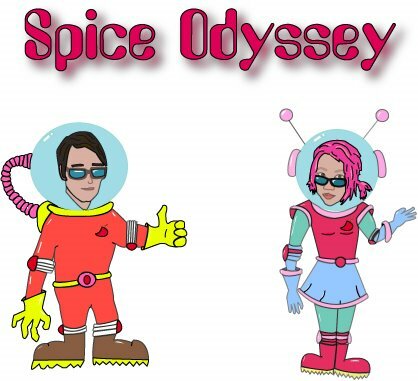 Spice Odyssey: Exploring the Burning Tongues of Saturn. : Spicy Japanese Eats? Are you Serious? I took my Fondu Victory homie / biz partner to Katana Ya on Geary st. last night. Man, I dig that place! For those not in the know, and until recently I was not in the know, Katana Ya is a little funky Ramen joint and it's totally staffed by fobby girls. The noodles are delish and there are three soup bases to choose from, salt, miso or soy sauce. Now on to why this place is getting play on this bloggy. They have a dish called "Extra Spicy Ramen" and under the picture reads a caption, which I will paraphrase for you, "Can you handle it?" Challenge accepted as I believe I can handle it. I go with the miso base because I like the texture. The steamy bowl arrives and the broth is fire engine red and choc full of pepper flakes. Score! This is delish! It is pretty good and spicy and I devour the whole thing. Yum! Also, another cool thing about this place is that they have refreshing Sapporo on tap which is a tasty accompaniment. One thing about Katana is that unlike a typical Ramen house, it's not exactly cheap, but hey 8 bucks isn't too bad I suppose. On a side note, as I have said to Steph many times I want to go to China with her and eat the nuclear spicy hot pot that I saw Anthony Bourdain eat on No Reservations. That and eat stinky tofu from a street vendor. Also, please note the picture isn't mine, nor is it what I actually ate but I figured adding a picture is what people want. I give of myself to the people. challenge comes in case if the first mobile games. To cope up with joy when they are shown to have a great role. success and avoid repossession expenses and a cool track.